I disagree because everybody is equal no matter how smart they are or how popular they are also it is a form of discrimination(meaning that you are excluding people from what you are doing because they aren’t as smart you or as cool as you). 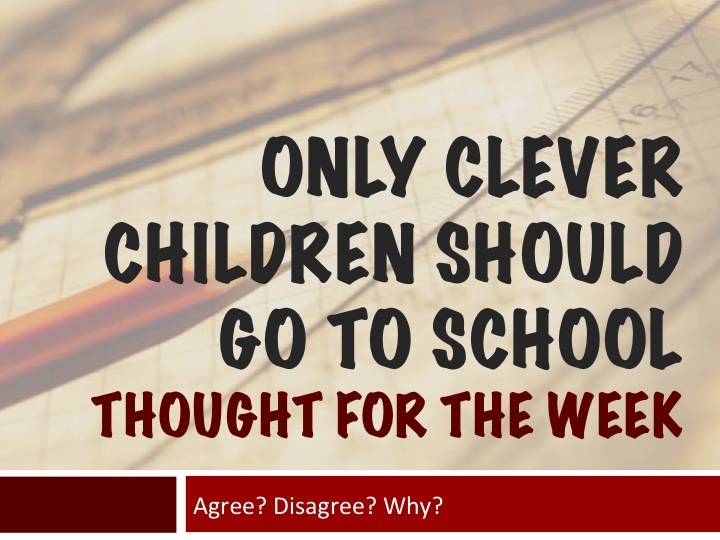 I disagree because they go to school and learn. I am sorry I thought I had written my whole name. I disagree because if you don’t know anything you can go to school to learn things that you don’t know. I disagree because how are the un clever children going to learn and get a good job when they get older. Well what kind of question is that all kids must go to school because kids can gain knowledge from school and mostly from school, but clever children have to be getting their knowledge from somewhere.That place is school so clever children had to have come to school at some point or they wouldn’t be so intelligent, like Steven Hawking his body is paralyzed but his brain is absolutely perfect and if he hadn’t been to school he wouldn’t have been so smart.Thank you for your attention. I disagree because how will the less brained children get smart ? I disagree because if someone is not as smart as a clever person, they will need to learn in school. Also, they can be smarter than the person who used to be smarter, so that person will have to go to school. This will go on if they are complacent enough. However, I also agree because everyone is born with a brain and is clever to do what they are born to do. I believe that no-one can be smart at everything! I disagree because everyone is the same and it does not matter if they are smart or not .